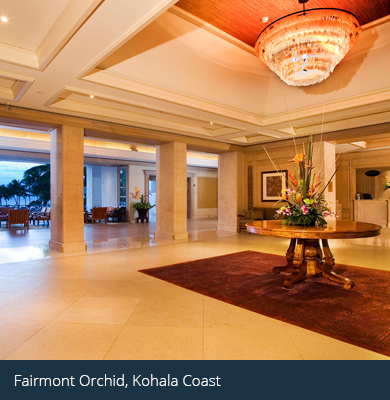 LOC International offers various types of Fridge and Minibar Management Systems, including keys, and Minibar Supplies. LOC International provides its clients with a trio of smart minibar seal systems, the Mini LOC I, II (also available in brass and silver) and III, adding an extra level of security to any minibar. 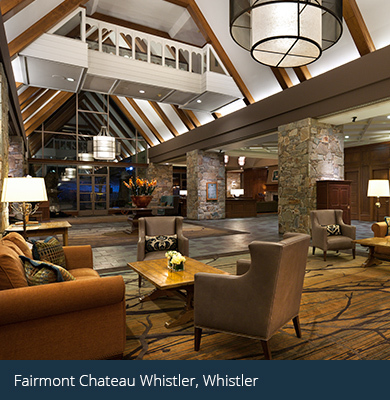 The Mini LOC is easy to install and easy for hotel guests to use. The Mini LOC System I is simply screwed to the door around the existing lock. The covers are closed by an inserted plastic tab. To access the minibar, guests must break the tab, open the cover and insert the key into the minibar lock. Like the Mini LOC System I, the Mini LOC System II is screwed to the door around the existing lock. The covers are closed by an inserted plastic tab. 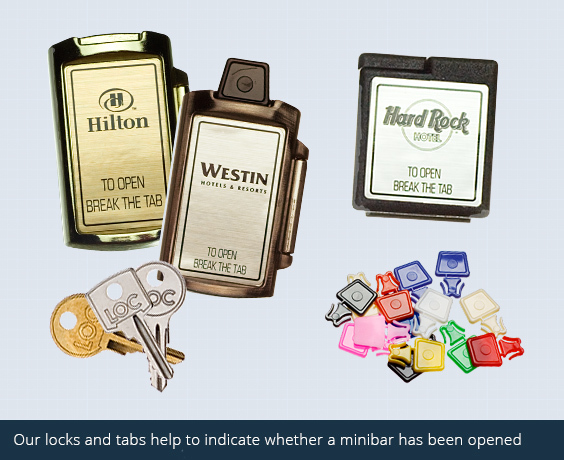 To access minibar, guests must break the tab, open the cover and insert the key into the minibar lock. The perfect solution for minibars without locks, the Mini LOC System III comes in two parts, the Main Part and the Hasp. The Main Part is screwed to the top (opening) corner of the door. The Hasp is inserted into the Main Part and the cover is closed. The end of the Hasp is placed against the side of the minibar and its position marked. The Hasp is removed from the Main Part and the end is screwed into the side of the minibar at the marks. To seal, the minibar door is closed, the Hasp is placed into the Main Part, the cover is closed, and the plastic tab is inserted. Guests must break the tab to access the minibar. The Mini LOC helps to indicate whether a minibar has been opened, which in turn facilitates and accelerates the daily inventory of all minibars. Our Mini LOC Tabs are used to seal the Mini LOCs. Once broken, guests can access the minibar lock or open the door (ML3) and hotel employees can know that the minibar has been accessed without having to look inside. We have the model you are looking for! 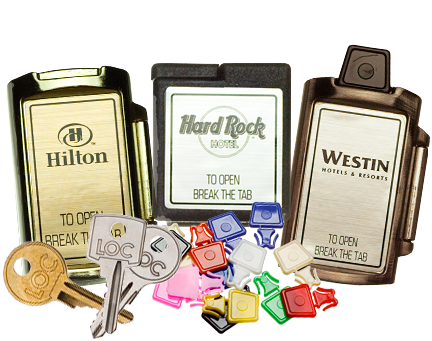 LOC International carries pre-cut minibar keys for models such as Dometic, Minibar System, Atlantic Minifridge, Indel B and many others. Keys can be cut according to clients specifications. We use the most accurate cutting equipment to guarantee that our keys open our client’s minibars each and every time. Please contact LOC International for information on Blank Keys, Pre-cut Keys or Key Rings. 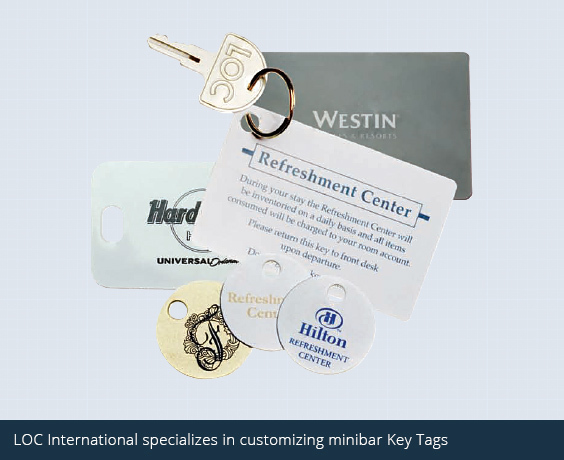 LOC International specializes in customizing minibar Key Tags for our clients. When ordering keys along with their tags our clients receive them all assembled free of charge and what better way to shop and save on labour cost and time. We’re a one-stop shop for our clients! For our Canadian clients LOC International offers a complete line of minibar supply products with maximum taste appeal. Hotel guests love our colourful assortment of snack items that can be offered at hotel entrances, restaurant areas, vending machines or in minibars. 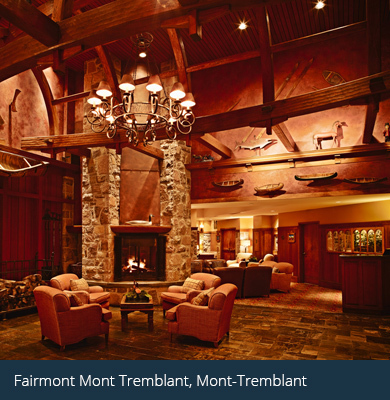 Our products are imported from Spain and have become very popular with hotel clientele. 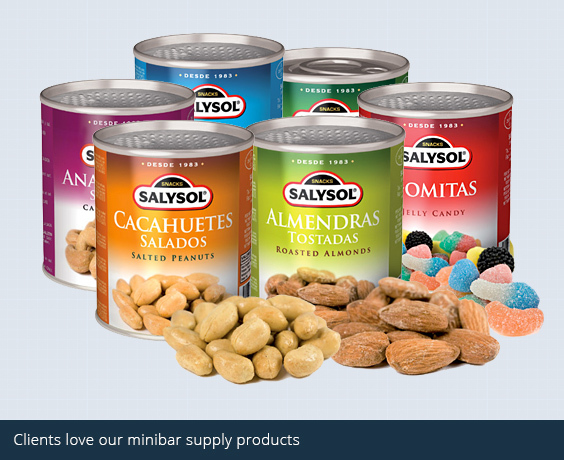 Clients love our minibar supply products for their ease of handling and practical features. 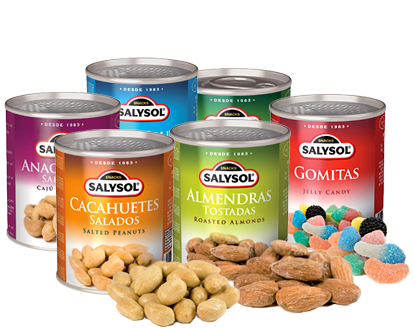 Our minibar supplies include Roasted Almonds, Sweet Roasted Almonds & Peanuts, Salted Peanuts, Chocolate Peanuts, Pistachios, Cashews, Cocktail Nuts, Toasted Corn and Jelly Candies.